As neuromuscular dentists, we are trained to carefully evaluate how the upper and lower teeth meet. This is called the Bite, or dental occlusion. If the lower and upper teeth don’t meet together properly when the mouth is closing, the muscles will close the jaw in a path that will stress and fatigue the muscles over time. Because of this bad bite, muscles won’t be relaxed when they need to be. This will cause muscle spasm and pain in the forehead area and can produce tension type headaches. A very high percentage of tension type headaches can be the result of an improper bite. An improper bite can also cause painful clicking or popping of jaw joint, neck pain, swallowing problems and snoring or sleep apnea. How do we correct a bad bite? As we mentioned earlier, if the teeth don’t meet properly, muscles of the face are in spasm and overworked, making it impossible to find the new corrected position. Tense muscles will never relax by just asking a person to relax the jaw. As neuromuscular dentists we can achieve optimum muscle relaxation through the use of the Myomonitor - Transcutaneous Electrical Neural Stimulation (TENS). If the muscles of the face can be relaxed and out of spasm, we have the ability to record the correct bite. 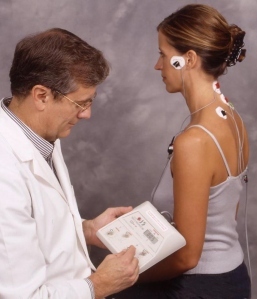 A TENS unit delivers a very mild electrical pulse stimulation to the skin over the muscles. In addition to spasm, tense muscles never have enough blood flowing through them, so they won’t have adequate amounts of oxygen and nutrients. When the Myomonitor is applied, spasm and lack of oxygen and constricted blood flow is reversed. This may take anywhere from 30-60 minutes in order to achieve a restful muscles. A restful position of the jaw can now be recorded and used to make a temporary device called an Orthosis. An Orthosis helps keep you in this relaxed position. 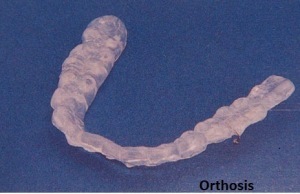 It is worn on the lower teeth to ensure that this new position is correct and has relieved the symptoms. In future blogs, we will discuss what treatment options are available after the Orthosis placement.